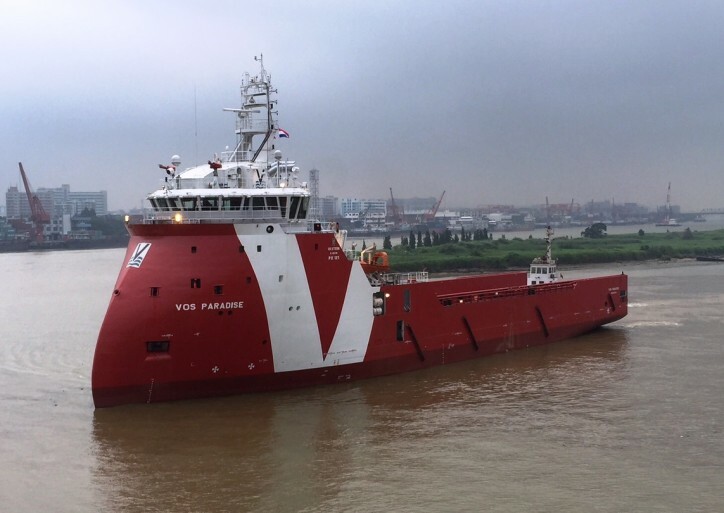 On 4th of August 2015, the Netherlands-based international shipping company, Vroon, took the delivery of its new offshore supply ship VOS Paradise. The handover ceremony was held at the Chinese Cosco Guangdong Shipyard. VOS Paradise is the second in a serie of six PX121-type Platform Support Vessels, which will be built at the Cosco Guangdong Shipyard in China. Their deliveries to the company are expected in 2015 and 2016. The 3.650-GT PSV vessel has Ulstein PX121 X-bow design, which special features ensure reduced and smoother vessel movements in harsher conditions. For the vessel’s operator it means better operational and fuel-efficiency advantages. Vroon new offshore support vessel is 83,3 m long, powered by diesel-electric propulsion system. It has 850 square metres deck space and a capacity to accommodate 26 people, offering high crew-comfort standards. VOS Paradise left the Cosco Guangdong Shipyard on Tuesday August 11, 2015.